C1.1 - The Fundamental Ideas in Chemistry (Atoms, The Periodic Table, & Chemical Reactions). C1.2 - Limestone & Building Materials (Calcium Carbonate, & Metals & their Uses). C1.3 - Metals & their Uses (Extracting Metals, Alloys, Properties & Uses of Metals). C1.4 - Crude Oil and Fuels (Crude oil, Hydrocarbons, Hydrocarbon Fuels). C1.5 - Other Useful Substances from Crude Oil (Obtaining Useful Substances from Crude Oil, Polymers, & Ethanol). C1.6 - Plant Oils & their Uses (Vegetable Oils, Emulsions, Saturated & Unsaturated Oils). C1.7 - Changes in the Earth and its Atmosphere (The Earth's Crust & The Earth's Atmosphere). This website contains a vast amount of videos covering all topics within the AQA GCSE Core, additional and Further Additional specification to enhance and support learning outside the classroom. 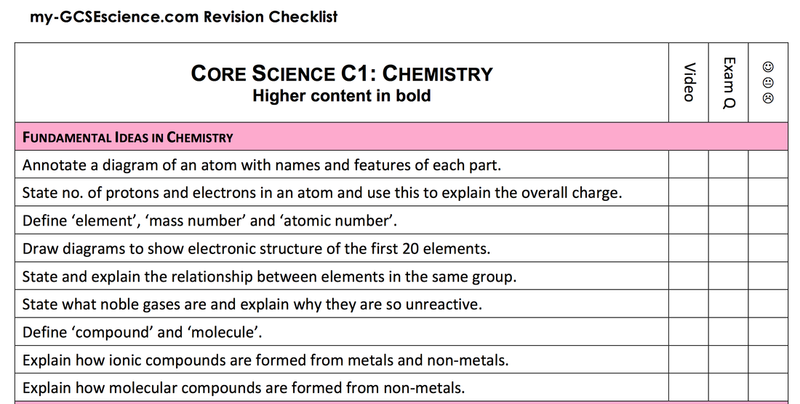 Click here for the Chemistry Unit 1 playlist. Link to checklists for B1, C1, P1, B2, C2, P2, B3, C3, P3 and a template for a revision timetable. Click here. Use these to make sure you have covered all topics for the exams.